Back in July 2012 Medway Craft Group (MCG) had a stall at the Unity in the Community day at Huntingdonshire Regional College. At this event we met with David Bale who told us about Wiseman Banda, who is partner to Cambridgeshire’s Worldwide Connection Project. He also told us about Wiseman’s intentions to set up a sewing group for teenage mothers. After some discussions at our next meeting we decided that this was something we would like to learn more about. We then got back in touch with David Bale and invited him to one of our meetings to tell us more about the project. Education in Zambia is compulsory, yet there is no funding for vulnerable children. The school has just five classrooms for its 500 pupils who attend in shifts according to age and whose teachers work a ten hour day. Mr Banda and his volunteers work tirelessly, without pay, for the benefit of underprivileged children. It was this selfless dedication that has drawn us to developing links with his school. During his recent visit to Huntingdon, in January, Wiseman kindly visited MCG to enlighten us further regarding his “teenage mums sewing project”. He told us that his aim is to set up a teenage mothers sewing group which would provide young mums with a skill that would enable them to support themselves and their children. Initially the project would involve making school uniforms for both their school and others. We are in the process of making a quilt for each of the teenage mother’s children. These will serve a dual purpose – to keep them warm on cold nights and to give them ideas as to what they could perhaps make to sell. We would also like to include knitted items as the group has a number of experienced knitters. These could also provide them with ideas for things they could make for themselves and to sell. Everything we send will be accompanied by simple instructions. 4th, 18th and 25th April. The Medway Centre is in use as a polling station on 2nd May. I am working on a gift for a friend as well as the Ten Stitch blanket. 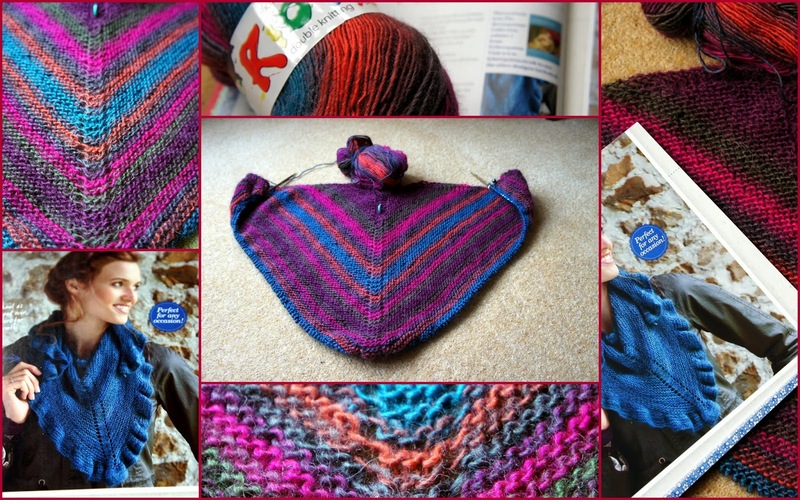 Its the Childry Shawl, I am using King Cole Riot, which is double knitting yarn in 30% wool and 70% acrylic. Its extremely thin double knitting yarn, so is working out fine for this shawl! It's absolutely wonderful that you found good homes for that yarn. With all the charity work you and your lady friends do, it's sure to be the gift that keeps on giving. Thank you for the donations, Sue. The KnitLit ladies were delighted with their yarn which will be put to good use making items for charity. A variety of good causes are represented. The bag of blacks, greys and whites I am making into a ten-stitch. Another batch of thinner eyelash-type yarn I will make into another ten-stitch. Both will be donated to one of the good causes I support. The balls of small oddments will be used during the Fusion school holiday activities where the knitting sessions are a great success. Please thank Cherry on behalf of everyone.